Generator on the Temple Mount. 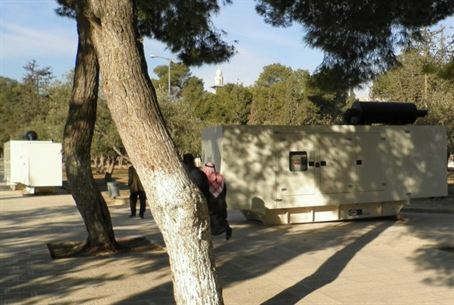 Huge electricity generators donated by the government of Jordan were brought into the Temple Mount Tuesday. A group led by Likud's Moshe Feiglin documented the entry of the generators into the Mount. Sources in the Jerusalem Municipality's Supervision Department told the Temple Heritage Fund that the municipality had not given permission to bring in the generators and that they were informed of the matter by Avi Roif, Commander of the Old City Police. The municipality sources were said to be outraged at Roif for allowing the generators' entry despite his not not being authorized to do so. "The Arabs may be planning a rebellion or a large-scale operation," the Fund's email added. However, it is also possible that the Wakf would like to use an alternate source of energy other than Israel's Electric company. There has been tension for other reasons around the Temple Mount in the past few days after news was leaked that Israel had cleared out an ancient tunnel that led from where the Davidson Visitors' Center currently stands, next to the Kotel Plaza, and the City of David.